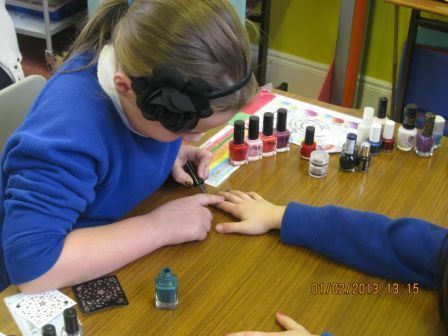 Ruth and Courtney, two young girls at Carnalbanagh Primary School in Northern Ireland, were so taken by their new sponsored child that they decided to set up their very own nail bar to raise money for Stand by Me. The initiative, which was their own idea, is proving to be a real success as the girls are charging 10p for nail painting and 20p for the addition of glitter. Their donations have already totalled £9 so the girls have decided to make this a monthly event. The boys, also wanting to help support Negassa in Ethiopia, decided to join in by making loyalty cards for the nail bar. This was a great way for them to be involved without the feminine touches. It is great to see how enthusiastic the Carnalbanagh Primary School is about their child sponsorship and we are supporting them with literature and information as they continue to raise awareness of Negassa and the desperate need in Ethiopia. There are photos of Negassa posted around the school, and the children talk about him as if he was a fellow classmate. He is a part of their school family. We are thrilled to hear that they are thinking of such unique and creative ways to raise money. Keep up the good work!